Angelina Gualdoni, Eclipse, 2013, oil and acrylic on canvas, 31 x 24 inches. In her 2010 show at Asya Geisberg, Angelina Gualdoni‘s work was in transition. Her canvases featured thin veils of paint, pooled in diffuse, ethereal shapes that defied definitive interpretation. The colors melded together, creating light veils punctuated by smaller bits of paint, like sticks and leaves floating on a rainbow puddle of gasoline. 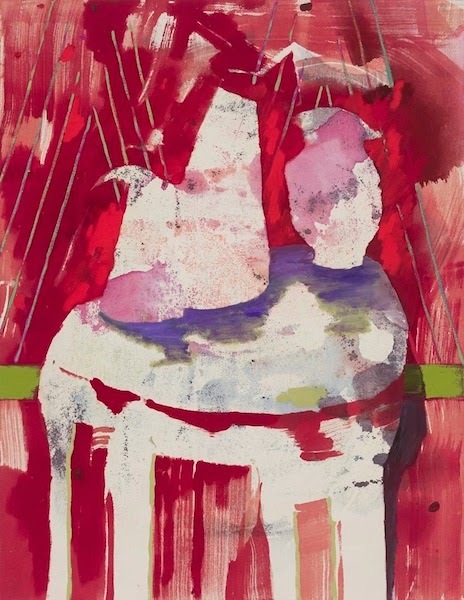 In “Held in Place, Light in Hand,” her excellent solo show at Asya Geisberg, Gualdoni continues her exploration of the pouring process, but adds more specific imagery, primarily fragments of still life and domestic interiors, to create paintings that seem on the verge either of resolution or dissolution, depending on your outlook. Matisse, Cubism, Bonnard, Frankenthaler, and the Fauves are all touchstones for Gualdoni’s lyrical new paintings. Angelina Gualdoni, Without A Net To Catch The Days, 2013, oil and acrylic on canvas, 38 x 34 inches. Angelina Gualdoni, The Lie Of Balance, 2013, oil and acrylic on canvas, 31 x 24 inches. Angelina Gualdoni, Whatever It Is, Wherever You Are, 2013, oil and acrylic on canvas, 50 x 47 inches. “Angelina Gualdoni: Held in Place, Light in Hand,” Asya Geisberg Gallery, Chelsea, New York, NY. Through February 15, 2014.